Pope John Paul II has been given a special viewing at the Vatican of Mel Gibson's film about Jesus Christ, according to reports. A church official told the National Catholic Reporter newspaper the the 83-year-old Pope had seen the movie over two screenings. 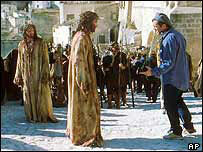 The Passion of Christ has proved controversial with some commentators describing it is as anti-Semitic. Gibson plans to release the film on 25 February 2004, Ash Wednesday. The film's producer, Steven McEveety, told the UK's Daily Telegraph that the Pope had asked for a copy of the film. "He is pretty well booked but he really wanted to see it," said Mr McEveety. Papal spokesman Joaquin Navarro-Valls refused to confirm whether the Pope had seen the film and what he thought. It hit the headlines after Jewish figures in the US attacked it for being 'dangerous' and portraying Jews in a negative way. Gibson's production company has arranged a number of private, pre-release screenings for Vatican officials. 'I loved it and it is not anti-Semitic, Father Augustine Di Noia, a senior official in the Vatican's doctrinal department, told Reuters news agency.